Empire star Jussie Smollett had his criminal record wiped clean earlier today as charges against him were dropped. The actor was accused of staging a fake attack, which caught wide spread media attention. Having the criminal charges against him erased came as quite a shock to many. But apparently this does not mean he is innocent in the matter. In fact, the state attorney handling the high-profile case claims Jussie Smollett is very guilty of the crimes he is accused of committing. About the staged racial and homophobic attack allegedly carried out by Jussie Smollett, First Assistant Cook County State's Attorney Joseph Magats said that dropping the charges did not vindicate or exonerate the actor. When asked if Magats believes Jussie is innocent, the prosecutor says this. "I do not believe he is innocent." Asked if Magats believes Smollett is guilty, the attorney says, 'Yes'. He is then asked, 'Why drop the charges?' To which he gives this reply. "Based on all the facts and circumstances, based on his lack of criminal background...We defer or do alternative prosecutions on 5,700 other felony cases." Jussie Smollett was facing 16 felony charges in the case. After the charges were dropped, Chicago's soon to be departing Mayor Rahm Emanuel expressed great anger at the decision, criticizing the move. Along with the charges being dropped, Smollett's criminal record was completely expunged. The case has been permanently sealed shut. The actor was facing years in prison if found guilty. Magats later stated that the violence sweeping Chicago was a more pressing matter and that, "some actor ...doing what he did, does not rise to that level." Magats went onto claim that 'real hate crimes' are 'vigorously prosecuted'. The attorney went onto praise the Chicago PD's probe into the alleged faked attack. But the Chicago Police are not pleased with the final outcome of this case either. This was further said about letting Smollett go by the attorney. "We stand behind the Chicago Police Department's investigation and our decision to approve charges in this case. We did not exonerate Mr. Smollet (sic). The charges were dropped in return for Mr. Smollet's (sic) agreement to do community service and forfeit his $10,000 bond to the City of Chicago. Without the completion of these terms, the charges would not have been dropped. This outcome was met under the same criteria that would occur for and is available to any defendant with similar circumstances." Jussie Smollett has maintain his innocence throughout the entire ordeal. The actor has already completed 16 hours of community service, working at Chicago's Rainbow PUSH on March 23 and March 25. He split his hours between working in the gift shop and offering advice on the film and music industry. Smollett was originally arrested on February 21. Chicago prosecutors had read aloud in court a number of text messages sent to brothers Olabinjo and Abimbola Osundairo that confirmed the attack had been planned by Smollett, outlining the means to buy supplies, drugs, and Maga hats used to carry out the alleged attack. There were also discussions of money. While all of the charges have been dropped in Chicago, there is still a federal investigation out on the threatening letter Smollett is accused of sending to himself. It is set in a different jurisdiction since the letter involves the U.S. Mail service. 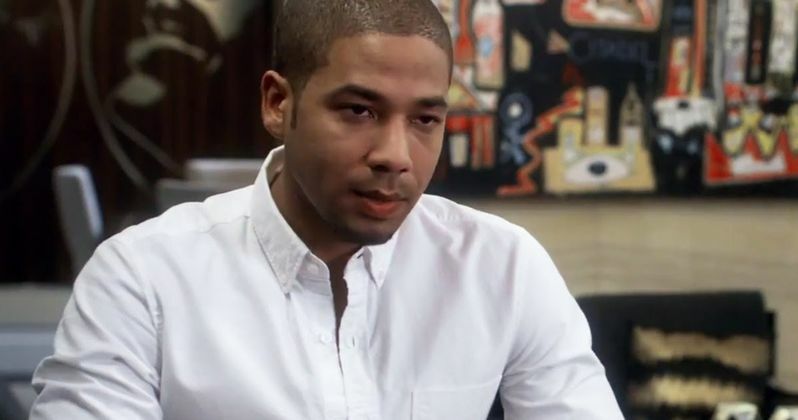 Jussie Smollett was dropped from the final two episodes of Empire's current season. There is no word yet if he will be back on the show for Season 6. Fox did send out a statement that they, "are gratified that all charges against him have been dismissed." This news was first reported at Deadline.